This is an additional half hour show which attempts to shed light on the phone hacking so called scandal. In 2011, the way the issue broke in the mainstream media showed obvious signs it was a carefully planned smoke screen, the main purpose being something other than exposing phone hacking. Phone hacking is a crime that the police should be investigating and charging people with whenever it occurs. In the past the police largely ignored it, and even joined in with the hackers, often sharing information. But the government enquiry was not an attempt to bring changes in the police. It was a pantomime with celebrities playing their parts (most unwittingly) in staging a diversion for something else. 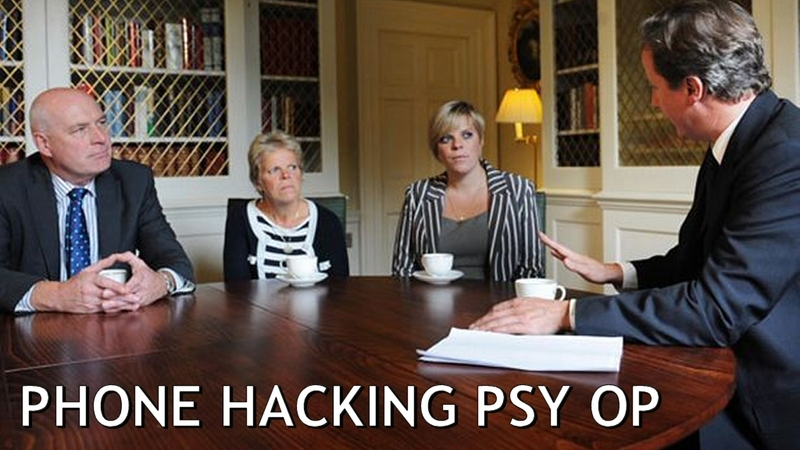 I have recently received requests from people asking me to consider certain "evidence" which is linked to phone hacking which prompted me to investigate the issue further and try and get to the crux of the hacking psychological operation. I feel this video does just that. One feature of the targeting / gangstalking I am and have been experiencing for ages [since 2010 after i reported the Hollie Greig case to my local plod] is that my mobile phone was hacked for months on end at various times in the past, and even recently. Calls would constantly be cut off mid call, also sounds of an "office" could be heard in the background often during calls [people talking, and odd noises that shouldn't be happening at where my call taker was eg. the sound of persons using a keyboard or typewriter] - even those very persons I was calling noticed this and commented on it more than once and we would discuss it as it was happening, and "beeps" would be heard at regular intervals during calls [also audio recorded by myself at the time] and many other strange events occurred that never happened before 2010 or since this period of intense surveillance, when the stalking was at an intense level. My laptop and desktop computers were also hacked mercilessly with items disappearing completely or being rearranged, or keylogged even, [when they record what you're typing on the keyboard, eg. in emails you're creating before they're even sent so they get immediate intel on anything - before even the recipient of the email gets the info!] or things would appear in my pc files or folder that weren't put there by myself, or even appear in my bookmarks bar, or desktop screen, where the icons are shown. I was lucky enough to have my mobile phone with it's video capturing service close at hand a couple of times around 2016 or so when I was fortunate to film events happening as they occurred eg. this example of keylogging on my pc - not Oscar-winning footage as it was filmed unprepared but I was able to record what was happening - the event only ever lasting for a few minutes, but this time I was lucky to capture enough of the event as it happened a few years back, and this type of thing only ever happened 2 or 3 times in total, and hasn't happened since, I might add: "Hacking: Being Keylogged in 2016" https://www.youtube.com/watch?v=-7amQNgNjgc&feature=youtu.be. By the way - having VPN doesn't work either, as any VPN can easily be hacked, especially by any hacker worth his salt. Very weird behaviour when trying to speak with the "customer services" of a popular VPN provider gave the game away that this particular firm I was with were surely compromised by the neer-do-wells who are paid to protect us, not surveille us. I shut down my subscription with the VPN firm and erased all signs of it minutes after realising what was going on - and hang the months I had left in the subscription - it had become worthless as the VPN paid for wasn't stopping the hacking in any way I had been noticing a number of times, but the tech guy simply reiterated time after time that VPN stops such hacking. I am reliably informed our UK govt. uses the hackers in the UK military for such indiscretions as hacking any Big Shot's computers, whereas little minnows such as myself get their trained employees when slaughtering any law-abiding citizen's human rights. But why would Carol Woods be targeted so badly for so long by so many UK government connected agencies? Carol is a whistleblower, and, I strongly allege that someone high up somewhere, who had a good knowledge of, or was even an organiser in the [failed] "supercasino" project in Lancashire lost a lot of money investing in that illegal [in many ways] project that never came to fruition that even ex-Prime Minister Gordon Brown was involved in helping getting stopped - the "supercasino" project - one of the main reasons behind why Carol Woods is targeted so badly all the time. This is her testimony, in her own words: http://criticalreader2006.blogspot.com/. As well as my phone being hacked much hacking has taken place in many other areas - eg. my computers, the electricity to my home also, my snail-mail ["Royal Mail"], my being followed about when i'm out, or characters already in place waiting for me at locations I go, pre-arranged appointments are compromised with the persons I'm to interact with being fed often totally false info about myself beforehand [eg. that i'm a troublemaker or insane, or whatever] and much more - everything created to intimidate or provoke or whatever by these characters who are able to do this type of thing, eg. rogue elements in our authorities, especially in the police, as who else has the power or ability to do such hostile and antisocial surveillance as is happening? Only the police, I contend, working with others such as the local town council who use - for their surveillance - down-and-outs, teenagers [and even younger I've witnessed on occasion] "loose women", elderly male and female characters and more who they've "recruited" - identical to the types who stalk and harass Carol Woods so often up there in Lancashire. My folder is full of pics of these recruited around here - especially the 6 or so close neighbours who live by me, who have ignored me for 12 out of the 14 years I've been at this address, but all of a sudden became part of my daily life - overnight - a couple of years back, acting so bizarrely one couldn't help but notice the strangeness, and when it was realised what was going on, everything was recorded as best I could in the folder - audio recording as much as I could, or video recording, or simple snapshots being taken. That folder is now thick with data, and kept in half a dozen safe locations with trusted confidantes.